Location – Lake Griffin Harbor is located on the southern shore of Lake Griffin, a glistening 10,000-acre lake that is a popular place to boat and fish. The eighth largest lake in Florida, Lake Griffin offers convenient access to the St. Johns River and, from there, the Atlantic Ocean. Lake Griffin Harbor’s spectacular location has long made it a popular 55+ community for retirees to live. Amenities – Our spacious lakeside clubhouse has many amenities that our residents and their guests have exclusive access to. Inside, there is a banquet hall with dance floor and performing arts stage, fitness center, library, full kitchen, billiards room, and card room. Outside, there is a screened and heated pool, shuffleboard courts, horseshoe pits, sun deck, boat ramp, 55-slip marina, and fishing pier. Homes – We wouldn’t be one of the best retirement communities in FL if it wasn’t for the quality of our homes. Lake Griffin Harbor has approximately 350 quality homes available in a variety of floor plans and prices. 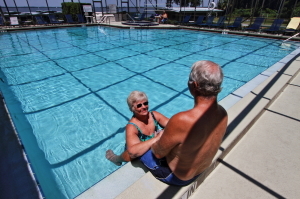 Residents – Our retirement community is a place where the residents are friendly and where everyone desires to stay active and have fun in a peaceful residential setting. For more information about Lake Griffin Harbor why it is one of the best retirement communities in Florida, please contact a member of our Lifestyle Team today.